Trump's Election Overshadows Energy Pipeline Protests Around The U.S. Pipelines are center stage in a fight over the nation's energy future, concerns about climate change and private property rights. Donald Trump's election means the battles are likely to continue. 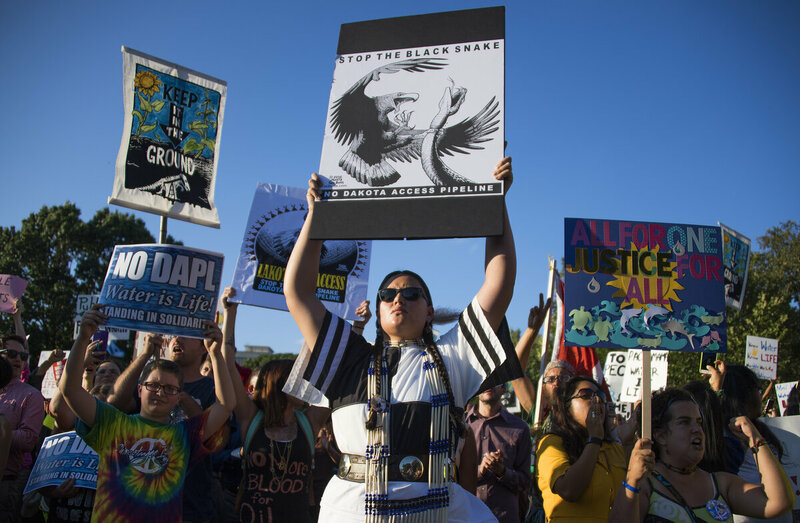 Trump's Election Overshadows Energy Pipeline Protests Around The U.S.
Demonstrators chant and hold up signs as they gather in front of the White House in Washington, D.C., to protest the Dakota Access Pipeline in September. Activists engaged in a national "day of action" Tuesday to protest the controversial Dakota Access oil pipeline. Native American groups' opposition to the project has gotten a lot of attention recently, but it's just one of many pipeline battles going on across the country. And Donald Trump's election and his stance in favor of fossil fuels are likely to mean those battles will continue. Pipelines have taken center stage in an intense fight over the nation's energy future, concerns about global climate change and private property rights. As the domestic drilling boom continues to produce massive amounts of oil and gas, there has been a secondary boom of new pipelines as the industry tries to move it all to market. Paul Hart is editor-in-chief of Midstream Business, a trade publication covering pipelines. Speaking to an industry crowd earlier this fall, he warned of the backlash. "You are the target of the environmental movement right now," he said at a conference in State College, Pa. "They have figured out that if they shut down the midstream, they can shut down the entire industry." Environmentalists were galvanized by their success getting the Obama administration to block development of the Keystone XL pipeline — a controversial project that would have shipped crude from Canada's oil sands. "I've even heard a new word that's developed recently," Hart said. "You can be 'keystoned.' Your project could be 'keystoned.' "
But this dynamic could dramatically change following the election of Donald Trump, who strongly supports the development of fossil fuels. TransCanada, the company behind the Keystone XL project, now says it wants to work with the new Trump administration to try to revive the project. Trump has also pledged to quickly approve projects that are currently in regulatory limbo. But it's unlikely the pipeline battles will die down anytime soon. In some places the resistance is entrenched — literally. 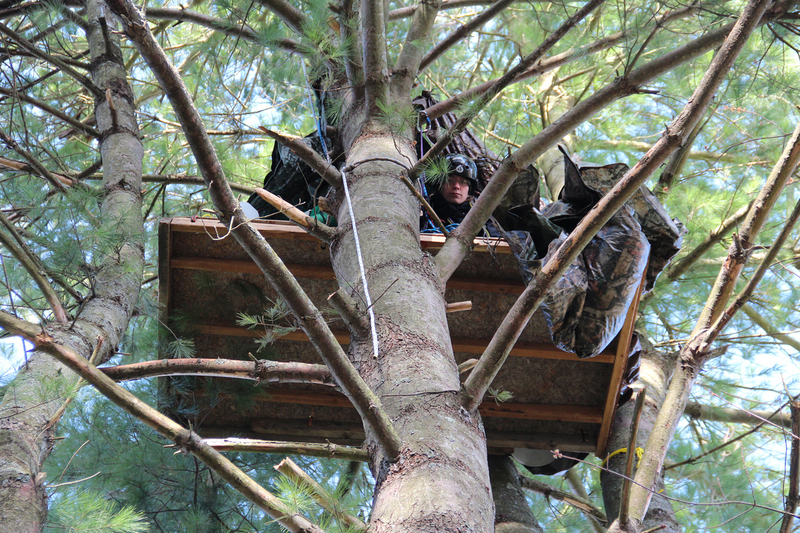 In March, Elise Gerhart climbed a tree on her family's land in rural Huntingdon County, in central Pennsylvania. She was trying stop a company from using eminent domain for a natural gas liquids pipeline. "Everything has failed us. At every turn the system has failed us. They've left us no choice," Gerhart shouted from the tree. "No one is coming to protect us." Elise Gerhart climbed a tree on her family's property in Pennsylvania rural Huntingdon County. She was trying stop a company from using eminent domain for a natural gas liquids pipeline. The trees were cleared that day, even though the pipeline has yet to receive all the necessary regulatory approvals. Gerhart and her mother were arrested and now face disorderly conduct charges. A month later, New York state — which has banned fracking within its borders — put up a major roadblock and denied permits to a different pipeline, known as the Constitution. It was designed to carry shale gas from northeastern Pennsylvania to New York and New England. The project had already received approval from federal regulators. In a more brazen move last month, climate activists simultaneously disrupted the flow of millions of barrels of crude oil traveling from Canada into the U.S. on five pipelines. They turned off valves and live-streamed it all on Facebook. Seattle-based climate activist Emily Johnston targeted a pipeline in Minnesota and was among 11 people arrested in four states that day. "Personally, it's quite scary," she says. "But we went into this with our eyes wide open." Although Johnston could get more than 20 years in prison, she views the threat of global climate change as a more frightening prospect and believes fossil fuel companies have become increasingly reckless as they expand their infrastructure. "They are themselves in a state of existential crisis because of climate change," Johnston says. "It's making them do really crazy things. As people see that more and more, they fight it." She calls the election a "major blow" and says she's still processing the news. "But I fully intend to be back at it and be as strategic as I possibly can, with a lot of other smart people," she says. Tim Spiese is involved with Lancaster Against Pipelines, a group fighting plans to build an interstate natural gas transmission line through parts of rural Pennsylvania. He predicts Trump's presidency will encourage more people to get involved with the environmental movement, and he compares the struggle to his own personal battle with alcoholism. "You do not make change until you reach your bottom," Spiese says. "I think a Trump presidency is our bottom. I think the divide will grow more distinct and it will get ugly, but it will ultimately be for the good." Carolyn Elefant, a Washington, D.C.-based attorney who represents landowners in pipeline cases, says Trump will have the opportunity to appoint at least two new commissioners to the Federal Energy Regulatory Commission, which is charged with approving interstate pipelines. "You might have a little bit more pressure from some of the Republicans to speed up the process," she says. "But there are many conservatives who believe in the importance of private property rights. This idea that private property is being taken from landowners to build infrastructure could be something that could earn some sympathy from members of Congress." Protests Disrupt Pipelines Across The Northern U.S.